Imagine the cache and power your commercial real estate project could have if the world knew the story behind it? Now that can become a reality as Barnes Creative Studios will tell the story behind your commercial real estate project in the form of new branded content commercial series to air on CNBC. Barnes Creative Studios are proud to be the producers of this brand new branded content commercial series called “#CREGroundbreakers”. 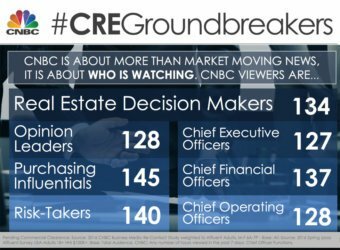 #CREGroundbreakers will tell the stories behind the biggest commercial real estate deals in America. An episode could present one project to be featured or multiple projects featured in an episode to bring down your cost of entry while raising the value of your projects with prime TV presence. The series will air as 90 second presentations during commercial pods within some of their biggest shows during “Business Day” including Commercials Across Street Signs, Worldwide Exchange, Squawk Box, Squawk on the Street, Squawk Alley, Halftime Report, Power Lunch, Closing Bell, Fast Money, and Mad Money. CNBC is the unparalleled authority in business news and information, reaching C-suite executives and decision makers throughout the day. Through a new, branded content series #CREGroundbreakers partners can bring the stories of key commercial real estate development projects to life. Through :90 of branded content, the highly-engaged CNBC audience will be introduced to some of the most riveting projects of the season. This commercial real estate branded content will feature the value proposition of the project with a call to action and offer captivating imagery shot via drone and using state of the art animation.